When you think of the City of Fountains, you probably think of Rome, right? Well guess what? Kansas City, Missouri is called the City of Fountains, too! In fact, KC has the second most fountains of any city in the world, right behind Rome, Italy. Some say that KC actually has more working fountains than Rome. 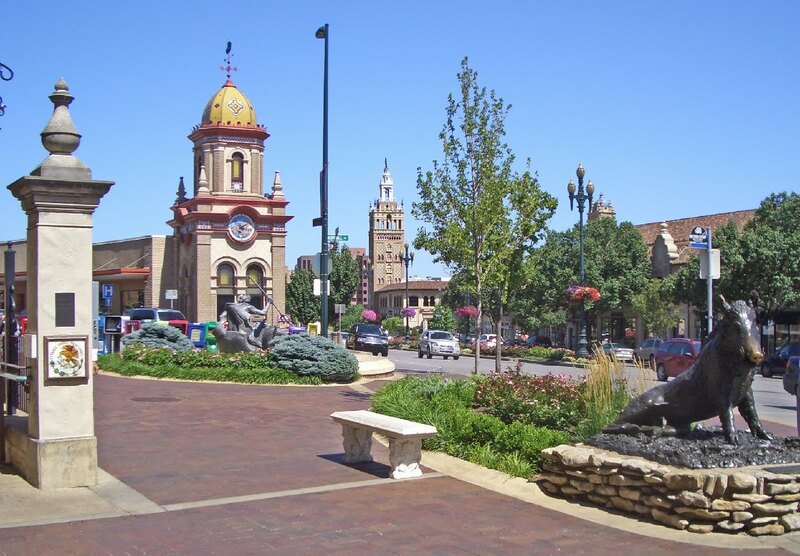 Many of Kansas City's fountains are located at the Country Club Plaza. 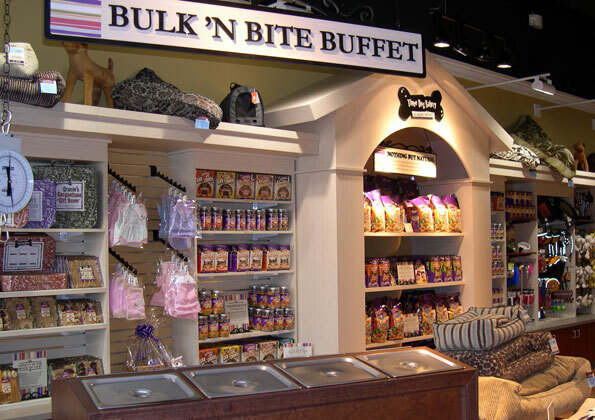 You can read what my pals over at A Tonk's Tail had to say about the Plaza in another #MOBlogPaws post, it's a pawsome spot to visit! The J.C. Nichols Memorial Fountain is the most photographed fountain in the city. The four horses are supposed to represent four rivers: the Mississippi, Volga, Rhine, and Seine. The Neptune Fountain on the Plaza originally came from England and was installed in 1953. The Bronze Boar has a sign telling visitors to rub his nose and drop a coin. All the coins go to Children's Mercy Hospital. 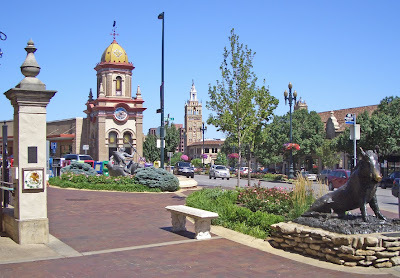 The Frog Fountain is located at Zona Rosa, another shopping district in Kansas City. 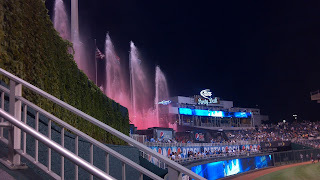 Some of Mom's favorite fountains are at Kauffman Stadium where the Royals play. Called the Water Spectacular, it is the largest privately owned fountain in the United States. Although Kansas City, Missouri is known for its fountains, the entire metro area has fountains. This is the Lenexa City Hall Fountain, dyed pink for Breast Cancer Awareness Month. They also dye it green for their annual Spinach Festival! It runs 24 hours a day, even in the winter. My favorite thing about the KC fountains? The first fountains in Kansas City were designed by the Humane Society so that dogs and horses would have fresh water. Sounds like KCMO has been thinking about its animals for a very long time! You can learn more about the fountains at the City of Fountains Foundation. Wouldn't you love to visit Kansas City? It would be a great location for a Blog Paws Conference if you ask me! Today is my second Thanksgiving with my forever family and things just keep getting better. Every day I appreciate how good I've got it, but today is the day we express our thanks for what we have. I'm thankful for Mom and Dad. We're a little family and it shows. There's nothing better than when we all cuddle together. 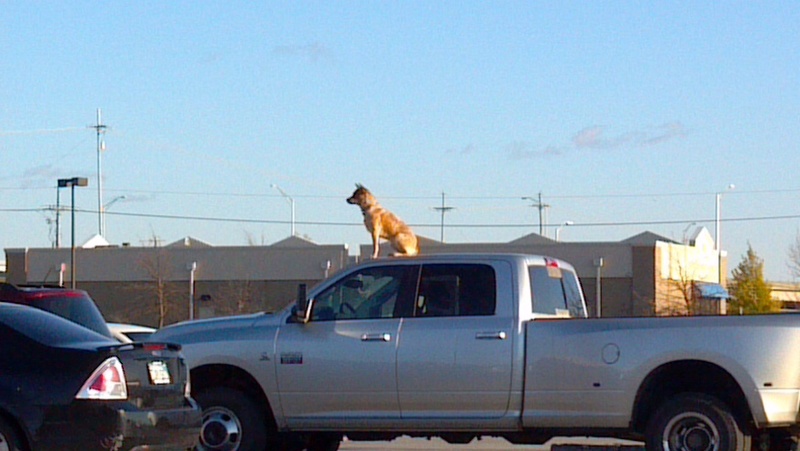 I'm thankful for Wayside Waifs. It's not fun being homeless, but the staff and volunteers at Wayside make it bearable. If it weren't for them, I wouldn't have my mom! I'm thankful for my Greenies. I get them every morning for breakfast and again at night before bedtime. I love Greenies! I'm thankful for warm blankets on cold days. I'd like to welcome another guest blogger today, the crew from "A Tonk's Tail"! They're on board with #MOBlogPaws too. Take it away! 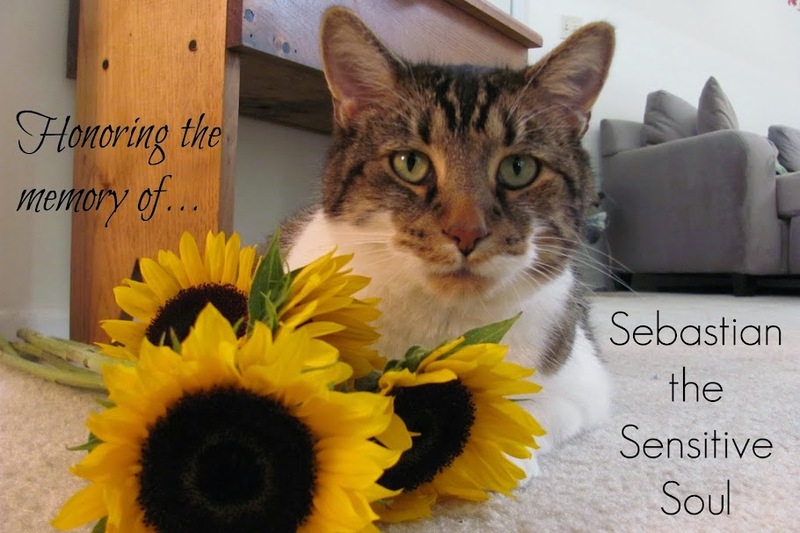 First we want to thank Sebastian for letting us be a guest on his blog today! We’re here to give you another compelling reason why BlogPaws should be hosted in Missouri in 2013. *shoves the boyz out of the way* Oh bother! If you want The Job done right, get a Woman to do it! Right @MaggieTKat? Kansas City is home to The Oldest Shopping Center in the U.S. – The Country Club Plaza. 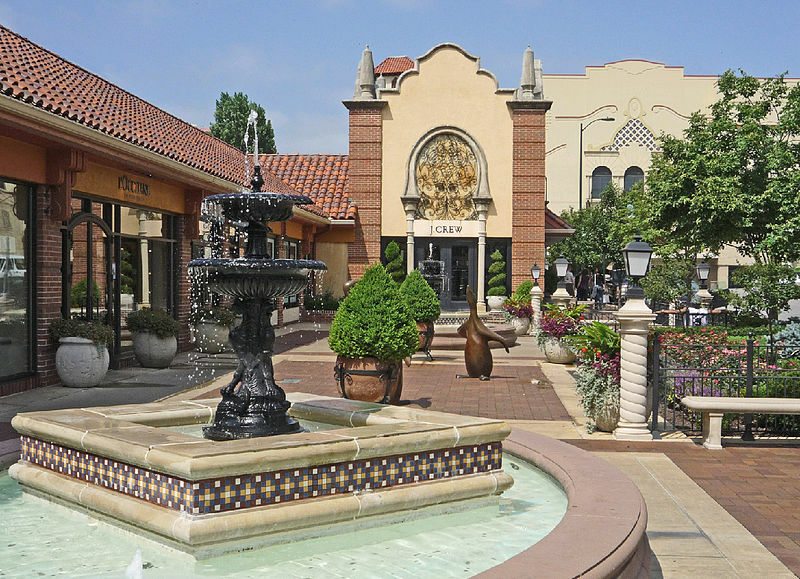 The Plaza’s 55 acre site was the very first shopping center in the world to be designed to accommodate automobile traffic, and attracts 10 million tourists each year. And the food, too: Ruth’s Chris Steakhouse, The Plaza III, Three Dog Bakery…*giggle* well, I didn't say I was talking about human food exclusively did I? It's a live art installation featuring the UMKC Conservatory of Music, the Cirque-style performances of Quixotic Fusion, the Vesuvius Fire Dancers, Irish vocalists and more! AND…. The Plaza Lights!! *SQUEE! 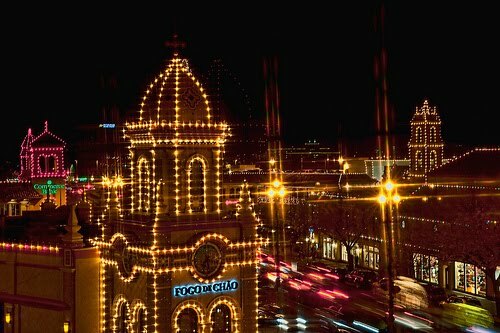 * Miles and miles and miles of holiday lights adorn every rooftop from Thanksgiving Night through mid-January. Isn’t it lovely? Oh please make Kansas City (or at least Missouri) the BlogPaws destination for 2013! You won’t regret it! Mom just loves the Plaza! It's one of the places she always had to visit when she would come to KC before she lived here. Thanks for guest blogging for me! Last week, I posted about bringing the BlogPaws conference to Kansas City, Missouri. This week, I'm happy to have a guest blogger to talk about bringing BlogPaws to a different Missouri city, St. Louis. Thanks so much to Wanda Kruse, aka @MaggieTKat's mom, for helping us out with our #MOBlogPaws mission! I’m Wanda, part of #MOBlogPaws, and I will be highlighting great things about St. Louis! St. Louis is the Gateway to the West, and we celebrate our great city with the incredible Gateway Arch. You can actually ride up the legs of the Arch to an observation point at the top! The Arch grounds and museum are free, but to the ride to the top requires a paid ticket. There are lots of free venues, so St. Louis is perfect for a family trip. We have a great art museum, science center, Anheuser Busch brewerytour, Purina Farms, Grant’s Farm (pay to park), and a wonderful zoo (pay to park). For those who enjoy adult beverages, you can sample beer or soda at both the Brewery and Grant’s Farm. We have all sorts of paid attractions, most very reasonable. The Missouri Botanical Garden is one of the country’s premier gardens, and features the largest Japanese garden outside of Japan. Various other sites include the AKC Dog Museum, Museum of Transportation, and of course the Arch. 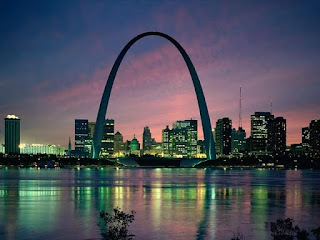 St. Louis is home to 3 sports teams, the Rams, Cardinals, and the Blues. Anyone love theater and music? There are a number of theaters and theater groups in the metro area. In the Grand Center Theater district, you will find the Fabulous Fox which features Broadway touring company musicals. Across the street you will find Powell Hall, home for the St.Louis Symphony. Other venues include Stages St. Louis and the RepertoryTheater. Concerts can be found at the Scottrade Center and the Verizon Wireless Amphitheater by checking ticketing companies. I love living in St. Louis. I can get anywhere in under 30 minutes from where I live. We have some of the cheapest gasoline in the Midwest! St. Louis is often described as a big little city. I have barely scratched the surface, so I invite you to come and experience my town for yourselves! Wow, Wanda! St. Louis sounds amazing! 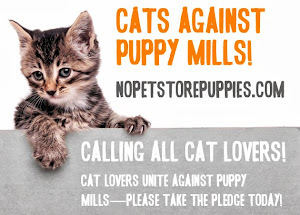 How will anyone be able to decide which city should get the BlogPaws conference? As much as Mom loves KC, she wants to visit St. Louis, too. Check back again next Monday when we will take a closer look at one of Kansas City's attractions! 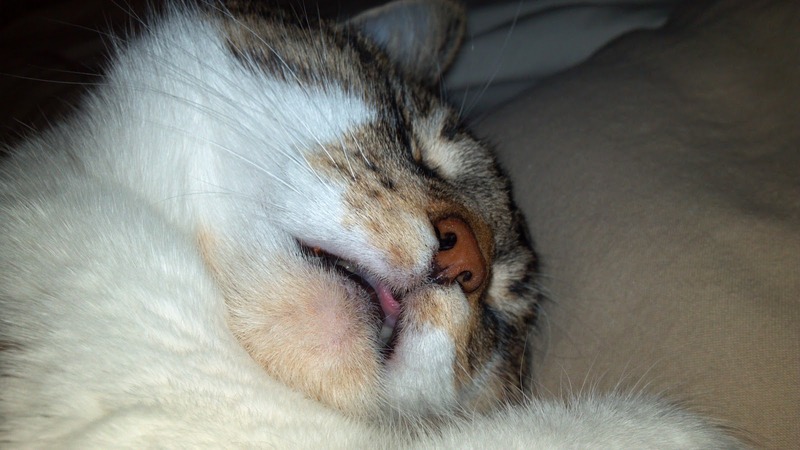 This week's Featured Furry is a senior kitty named Phylo. Poor guy has really had his world turned upside down. He had lived with his family for 10 1/2 years when he was surrendered to Wayside Waifs in Kansas City. Unfortunately, one of his humans is battling leukemia and the doctors said it would be best if there were no cats in the home. So, Phylo is now at Wayside looking for a new home. 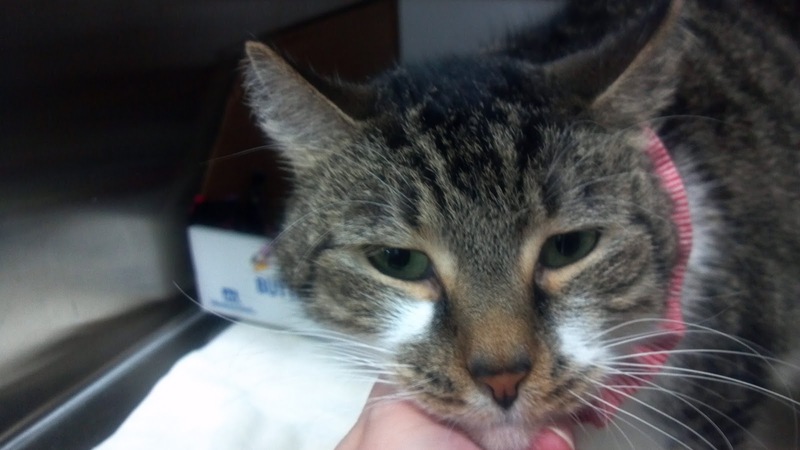 Phylo is about 11 1/2 years old and is a rather large domestic shorthair cat weighing in at 22 pounds. He's pretty laid back and isn't much into playing. 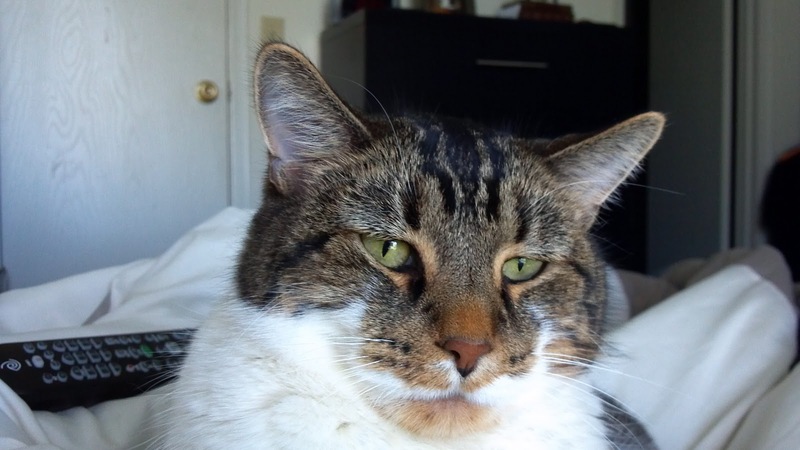 He would make a great pal for someone who wants a cat to keep them company around the house. He doesn't get along with other cats, so he'd like to be the only kitty in the family. Mom and I talked about it and we don't think the doctors were right in this case. We think both Phylo and his human are worse off for not being together during this difficult time. Unfortunately, that's the way things are now. Phylo looks pretty depressed and really, why wouldn't he be? I hope that his stay at Wayside is as short as possible and that he finds a caring family that will understand his situation. Keep in mind, November is Adopt a Senior Pet Month. Petfinder.com has a great article outlining the Ten Reasons Senior Cats Rule. Take a look at the article, then come over and meet Phylo. He'd like a chance to get to know you and show you himself why he'd make a great addition to your family. Mom has attended two BlogPaws conferences: BlogPaws West in Denver, September 2010 and BlogPaws 2011 in the Washington, D.C. area. 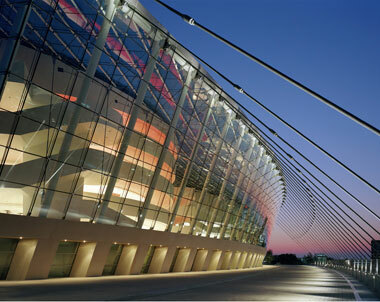 The next conference will be in Salt Lake City in 2012. 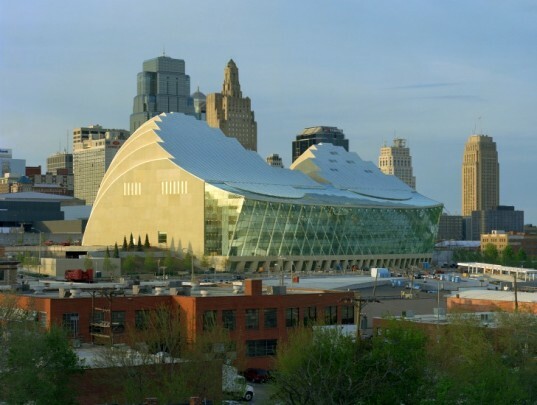 I am now going to start a campaign to bring the 2013 conference to the midwest, specifically Kansas City, Missouri. J.C. Nichols Memorial Fountain, a Kansas City landmark. I live in the Kansas City metro area, on the Kansas side of the state line. It's a great place and I think it would be the perfect place for a conference like BlogPaws. 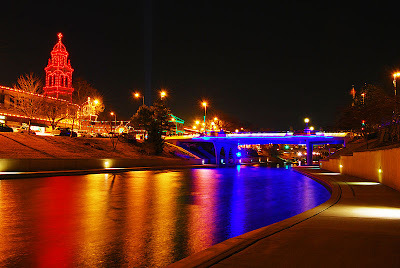 You might think I'm biased because I live here, but other people think KC is an awesome place too! Check out this article from the September issue of Wild Blue Yonder magazine featuring KC and many of its unique offerings. You'll get to hear more about some of these places in upcoming blog posts (this is a full campaign!) 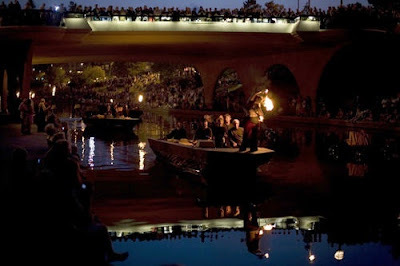 from me, Mom and other local Kansas Citians who love this city passionately. And there's more! Frommer's recently named Kansas City as a Top Destination for 2012. Why wouldn't the BlogPaws crew want to come to a Top Destination? Not only is it a top destination, it's a convenient destination! We're in the middle of the country, so we're easy to get to, whether it is by flying or driving. According to the website travelnotes.org, from KC to Dallas/Ft. Worth it is about 510 miles. To Denver or Columbus it's about 610 miles. To Chicago it's about 540 miles. I hope you stay tuned for all of the upcoming posts and I hope you jump on board with team #MoBlogPaws. 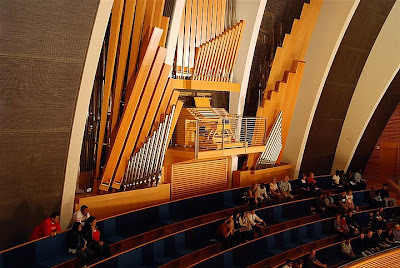 KCMO has a lot to offer and I would love to share it with all of my blogging buddies! 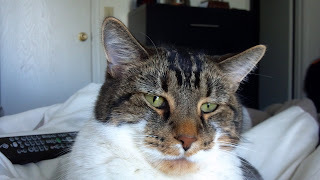 Me and Mom are very saddened to hear that Jack the Cat went Over the Rainbow Bridge today. We were sending lots of prayers when he was lost that he would be found. When he finally was, we were thrilled. He got more prayers from us while he was undergoing treatment and we thought that he was on the road to recovery. Unfortunately, that wasn't the case. He was just too sick to make it. We now send prayers to him, his human Karen, and all those that fell in love with him over this journey. We know that the Rainbow Bridge is a beautiful place to be and he will wait for Karen without any more suffering. Oh my cat! Mom can't stop talking about Stitch! He's a five-year-old Siamese mix available for adoption from Wayside Waifs in Kansas City. She keeps saying things like "He's such a lover!" and "He gives the best hugs!" Well, I beg to differ since I'm the sweetest, cuddliest cat in the world, but it's hard to argue with Mom when she has found a new shelter love. Stitch has quite a story. He was transferred to Wayside from a smaller shelter that didn't have the resources to give him the care that he needed. He was in pretty bad shape, possibly having been attacked by another animal. The other shelter sewed him up, but by the time he got to Wayside, the wounds were opening up and had to be tended to again. He had stitches around his neck and running down and under his right arm. The awesome V-E-Ts at Wayside got him all fixed up and sent him to foster to heal properly. Let me tell ya, now that he's all better, he hasn't let those old injuries turn him sour. When a volunteer opens the door to his kennel, he gets up and wraps his paws around their neck, nuzzling their face and purring like crazy! Of course, Mom is a sap and eats it all up. 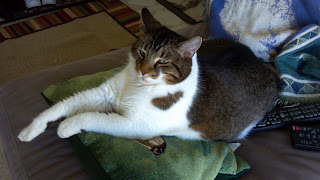 Now, being a cat, when Stitch is done with all that nuzzling and hugging business, he lets you know. He's not shy about telling you when enough is enough so of course all his cuddling is done on HIS terms. Another thing, Stitch isn't fond of children, so he would be best as a pet in an adult home. If you think Stitch would be a good match for you, go meet him at Wayside Waifs. You'll at least get a hug out of the trip! 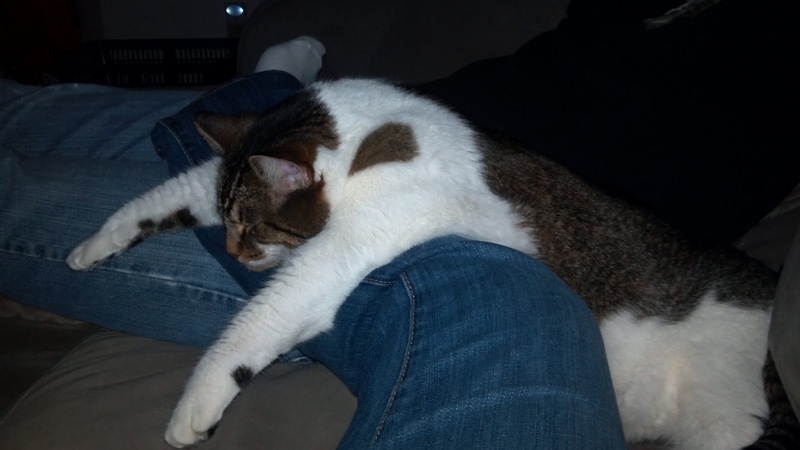 UPDATE 11/5/11: STITCH WENT TO HIS FOREVER HOME TODAY! CONGRATS STITCH!! Mom and Dad decorated the house for Halloween. We never have trick-or-treaters, so the decorations are just for us and the neighbors. Not only were there decorations and candy for Mom and Dad, but I got a treat too! I got a compressed nip pumpkin! I didn't even have to say trick-or-treat! Stay safe on Halloween, pals! I'm going to roll around on my nip pumpkin now.